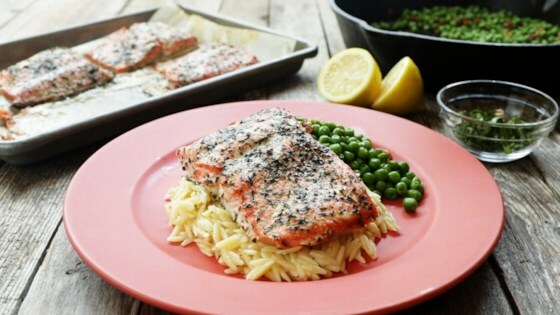 "Orzo, lemon, basil, bacon, peas, and baked sockeye salmon come together to make a quick and easy weeknight pasta dish for the whole family." Preheat oven to 450 degrees F (230 degrees C). Line a baking pan with aluminum foil or parchment paper. Bring a large pot of lightly salted water to a boil. Cook orzo in the boiling water, stirring occasionally until tender yet firm to the bite, about 10 minutes. Drain. Mix garlic powder, 4 leaves basil, and 1/2 teaspoon salt together in a small bowl. Place salmon skin side-down on the prepared pan. Brush with 1 tablespoon butter; sprinkle garlic-basil mixture on top. Bake in the preheated oven until salmon flakes easily with a fork, about 8 minutes. Remove and let rest. Place bacon in a skillet over medium-low heat and cook, stirring often, until crispy, about 4 minutes. Add 1/2 teaspoon salt and peas. Season with pepper. Cook and stir until peas are heated through, 3 to 4 minutes. Whisk remaining 3 tablespoons butter, juice from 1 lemon, and remaining 1 teaspoon salt together in a bowl. Pour over the cooked orzo and toss to coat. Season with pepper. Divide orzo among 4 plates; top with salmon and place peas on the side. Garnish with the remaining basil. Drizzle remaining lemon juice on top. We really liked this. Made it as instructed except I added a few grates of parmesan to the orzo. Good enough for company. Easy and good. I mixed the peas with the orzo. the family loved it, I loved a "whole meal"recipe, no thinking required.....will definitely make again. was afraid the bacon would overwhelm the salmon, but was great! I made no changes. It was a nice recipe, but I not as tasteful as I’d hoped.